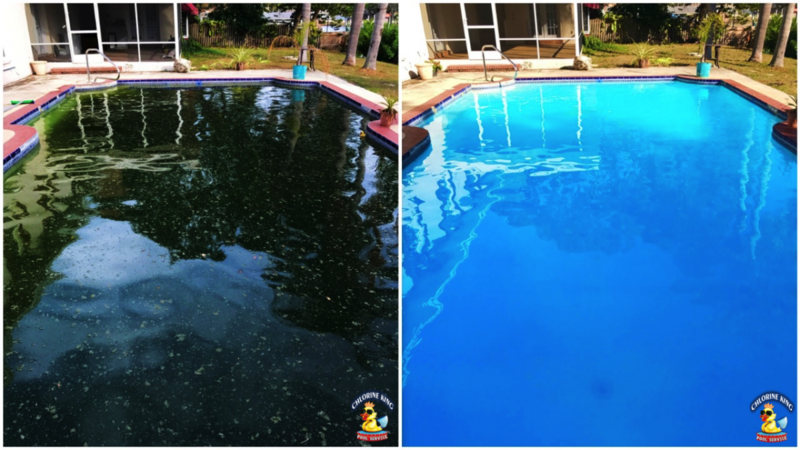 How To Clean A Pool Filter - Our Work - Chlorine King Pool Service, FL. 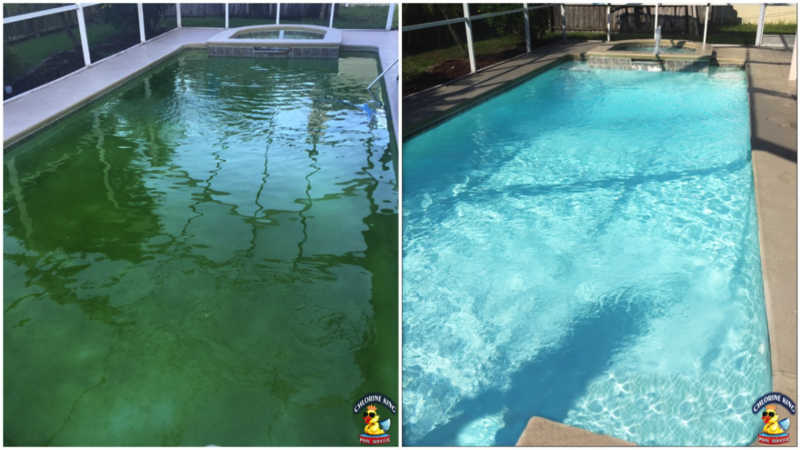 Chlorine King Pool Service is happy to show you the results of our services! If you're looking or the information on how to clean a pool filter then you have come to the right place. Often times when a pool turns green that could be attributed to a dirty filter. So when Chlorine King Pool Service gets hired to clean out a green pool one of the first things we do is clean out the pool filter. 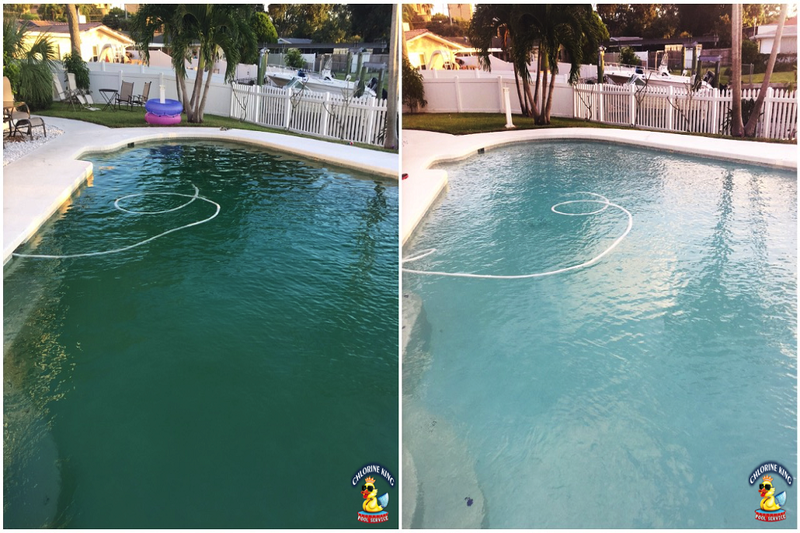 This client had just purchased their home and needed a makeover on their pool equipment. As you can see their pool was also green. 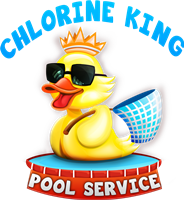 They decided to give Chlorine King Pool Service a call to get their issues resolved. The turnaround took under a week and the results speak for themselves. This homeowner went out of town to handle some family issues and upon coming back their previous company abandoned them. 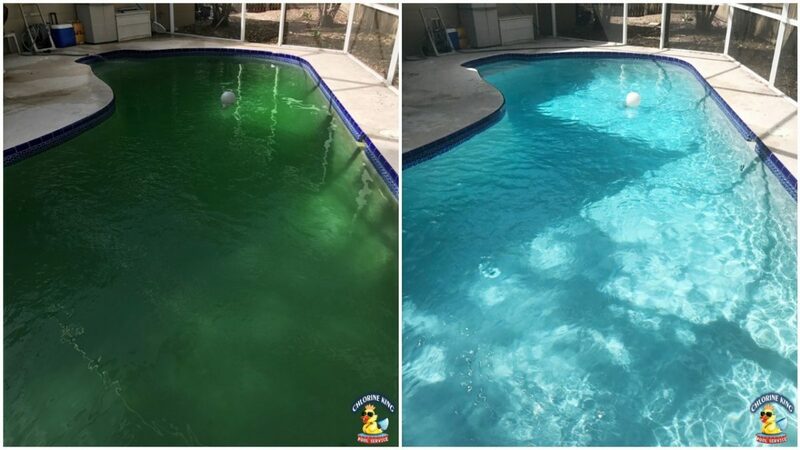 As a result their pool turned on them and it was green in no time. 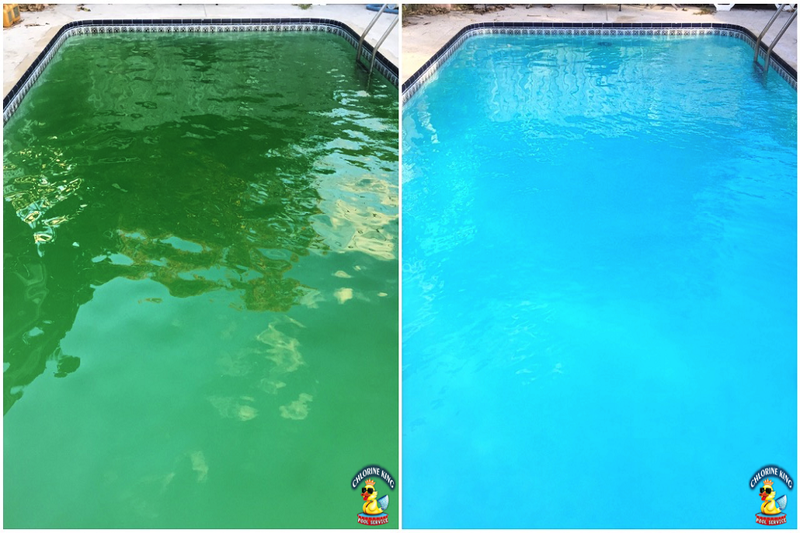 After using our green-to-clean process the pool is back up and running once again! This new home owner was looking for a pool cleaning service to take care of their new investment! After identfiying some safety and equipment issues we were able to get this pool looking as good as ever. 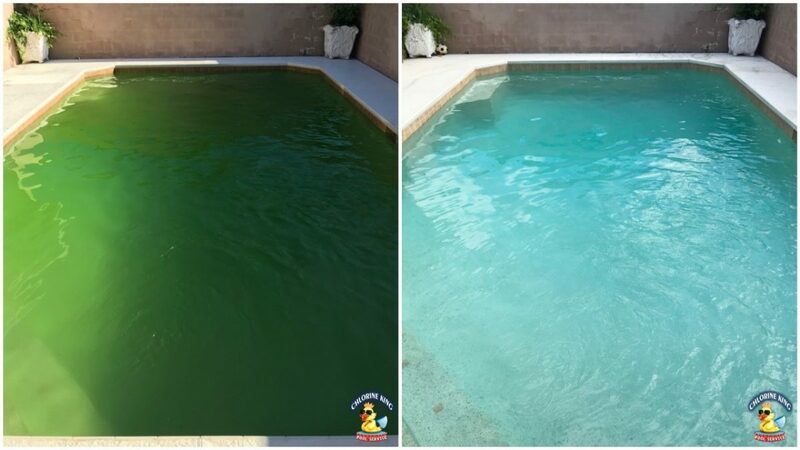 Don't let a green pool get you down, give us a call now and let us fix it! 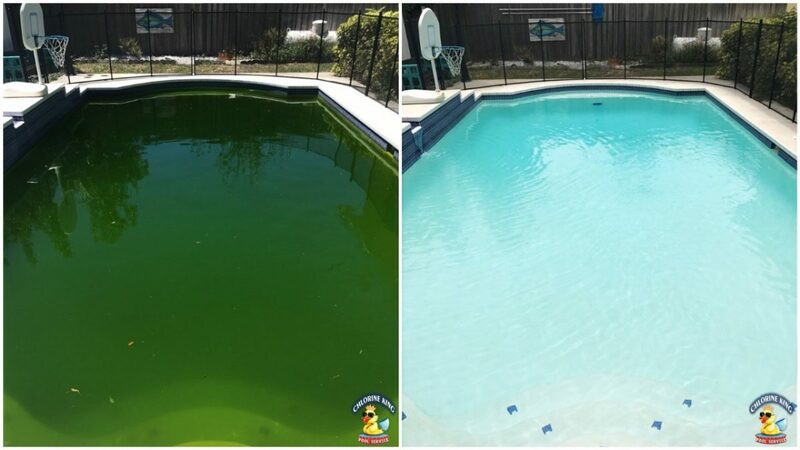 The home owners' previous pool cleaning service did not understand chemistry or proper maintenance. So they called us out there and we did what was necessary to bring the pool back. They said their pool has not looked better, ever! That's the Chlorine King difference! 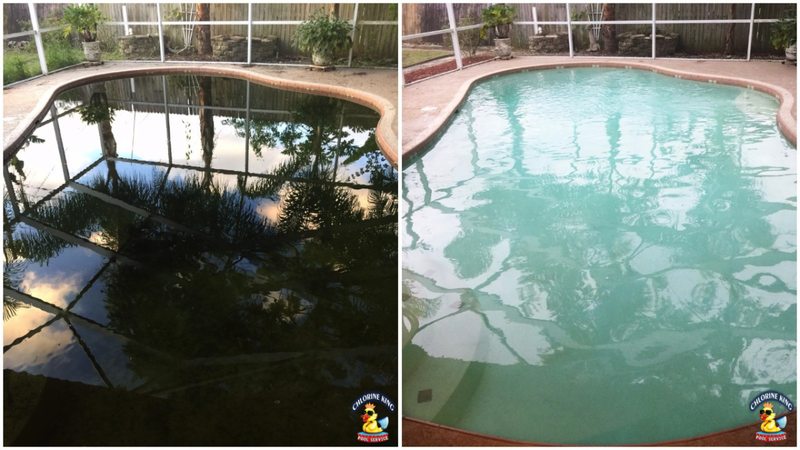 The swimming pool home owners here needed a pool cleaning service to get their pool looking the best it could be. So they called us out and we took care of the issues they needed so they can start swimming again! We had this one turned around in 3 days! How's that for a quick turn around time? 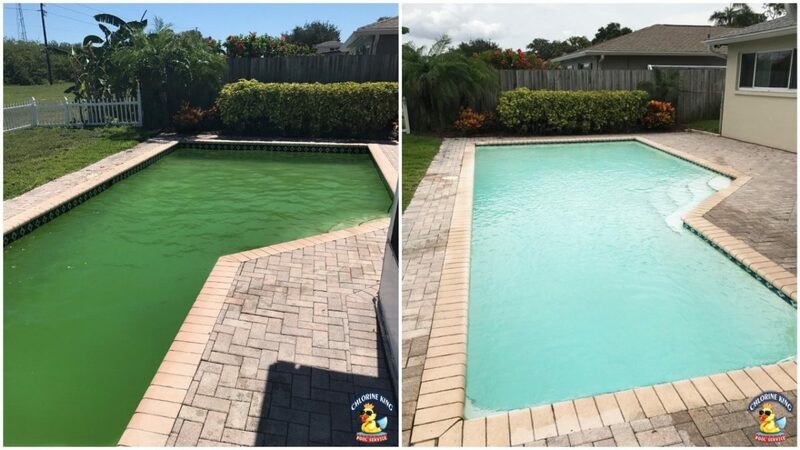 The homeowner was tired of not being able to swim in their pool because it was green. He told us that his family has not been able to use the pool so far this summer because of how bad it is. Well, we ended that problem! They are thrilled to be using their pool again! This pool belongs to a new homeowner who wanted a pool school. Once going over everything they decided to hire us so we can clean the green pool and make it swimmable. Mission accomplished! The daughter of these home owners called and said their previous company dropped the ball. We had our work cut out for us but with our relentless work ethic we got this one turned around pretty quickly. All parties concerned were very impressed! 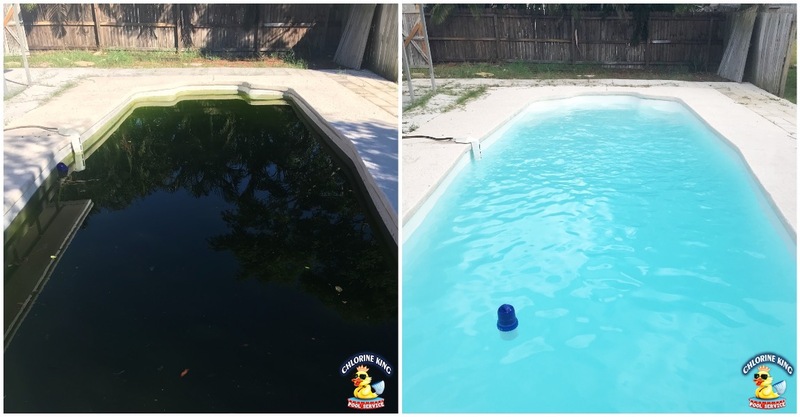 The homeowners of this pool said their previous company couldn't keep the pool in check. It quickly turned on them so they gave us a call. It was a bear but we prevailed and now the pool looks fantastic! We never quit working until it's perfect! This house was closing in a few days and they needed the pool up and running. We came in and quickly turned it around. The realtors on both sides and the new home owner was very happy with the results. The sale of the home went through smoothly with a large part due to the clean pool! 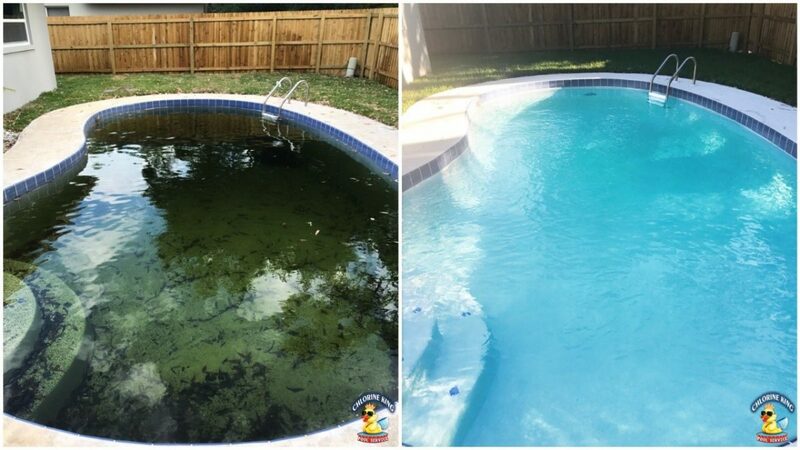 The previous company couldn't keep the pool algae free. After testing the water we found that the pool had a very high phosphate level. Once treated the pool has not had an ounce of algae in it since! The home owners are thrilled! 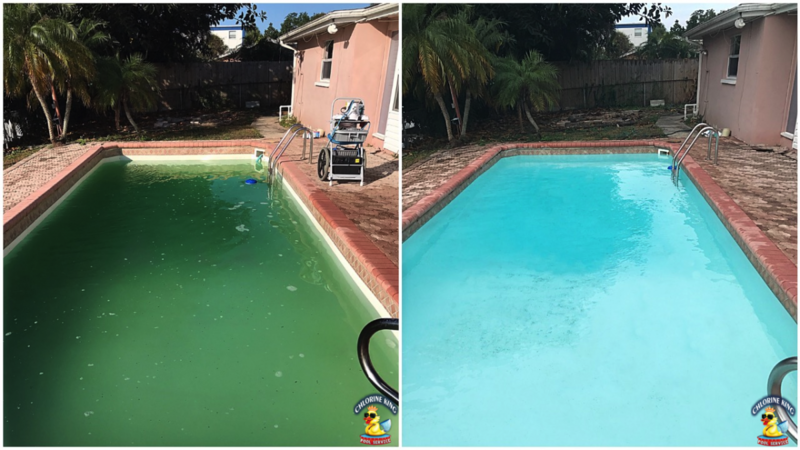 This was a house bought by foreclosure and the new owner wanted the pool cleaned up ASAP so he could put it on the market. We brought in some heavy artillery and got his pool cleared up pretty quickly. We uncovered some awesome inlay's too! 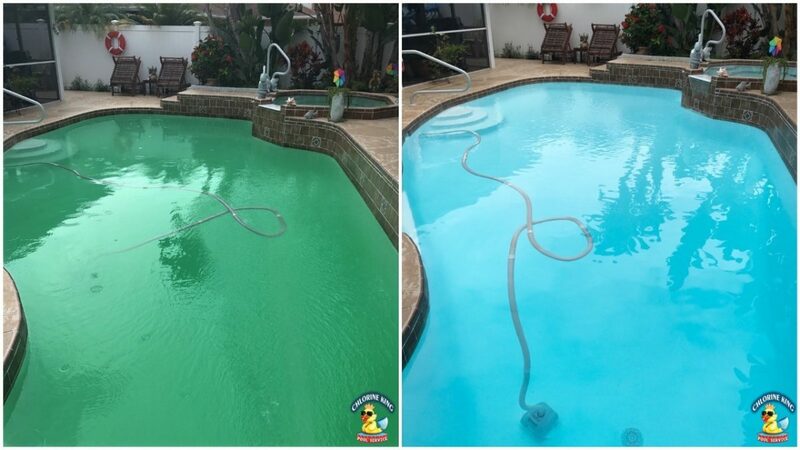 The pump of this owners pool died while out of town and the pool turned green. After addressing the pump issues we were able to get this turned around pretty quickly and the owner couldn't be happier! 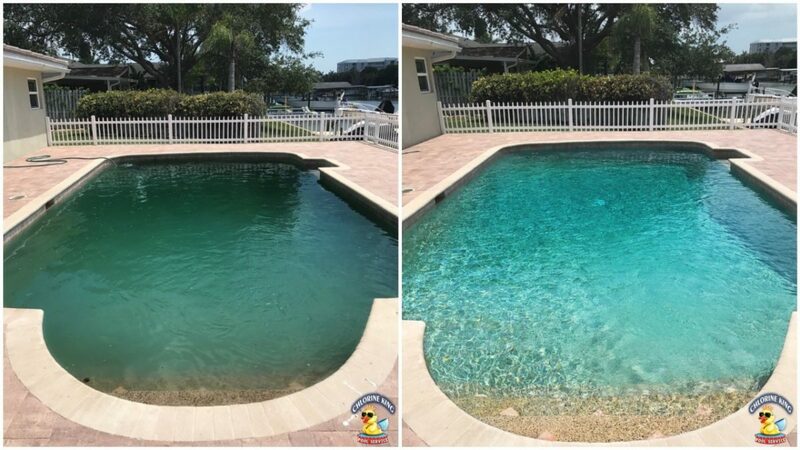 Realtor's really love Chlorine King's clean-out process because it's quick, effective, and doesn't carry the large price tag of an acid wash. We had this one turned around no time just in time to go onto the market! This pool was in bad shape. You couldn't see a pool brush 6 inches into the water. 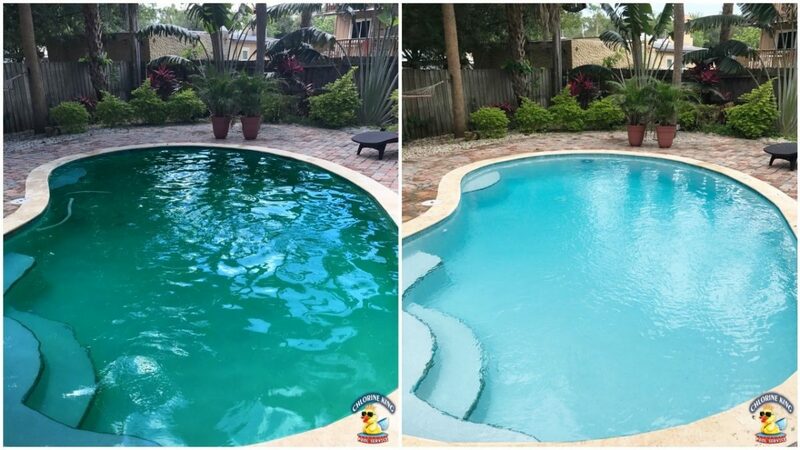 With our process we were able to turn this pool into a healthy and swimmable paradise in only 3.5 days! The results speak for themselves. 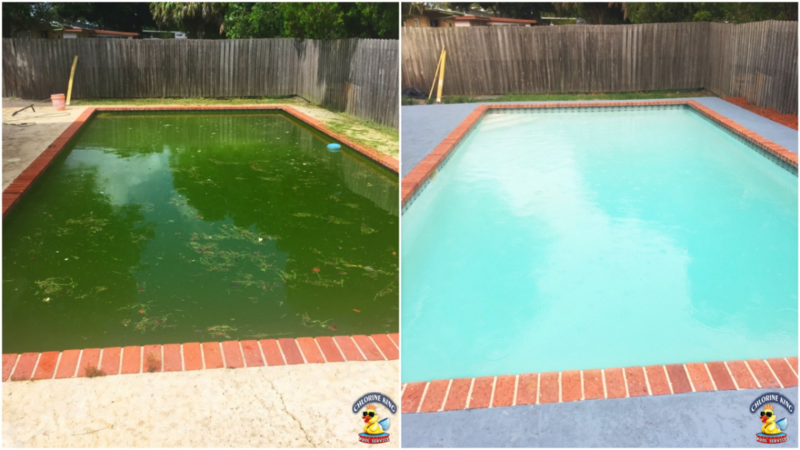 We can help you with your green pool! This was a realtor property that is about to go on the market and they needed someone to come in and fix the pool so the home can sell. In short time we were able to turn this pool around into "better than new" shape. With the new surface this pool looks amazing! 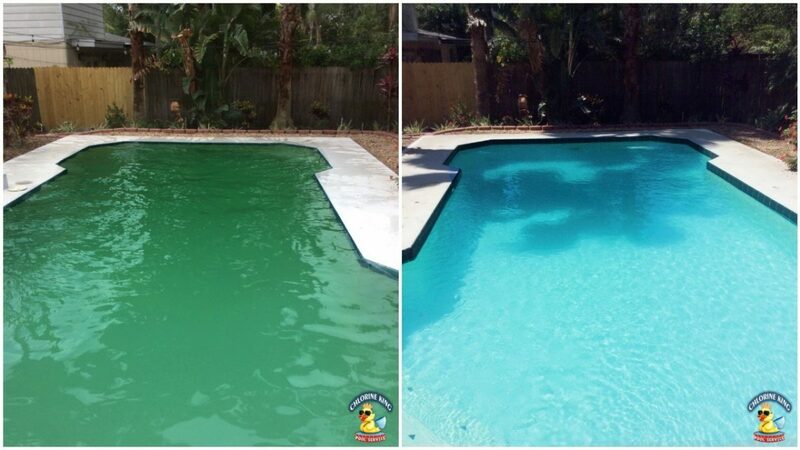 Another wonderful transformation from Chlorine King Pool Service. This transformation only took 3 days from start to finish. 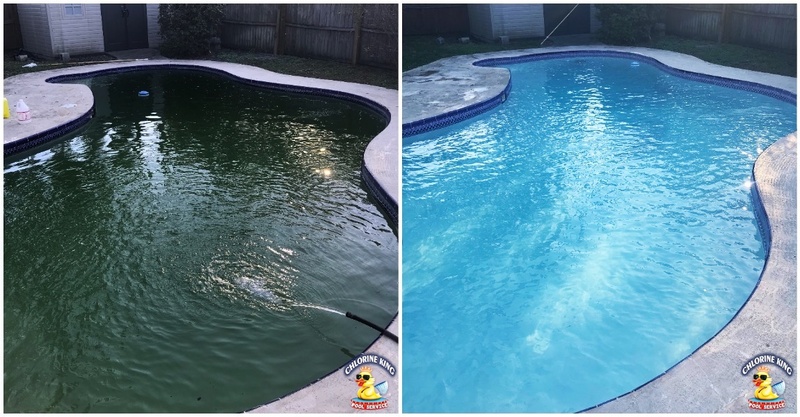 The homeowners were tired of their pool being a swamp (although a pretty green) and really wanted to make it into a swimmable pool again. So, here we are! 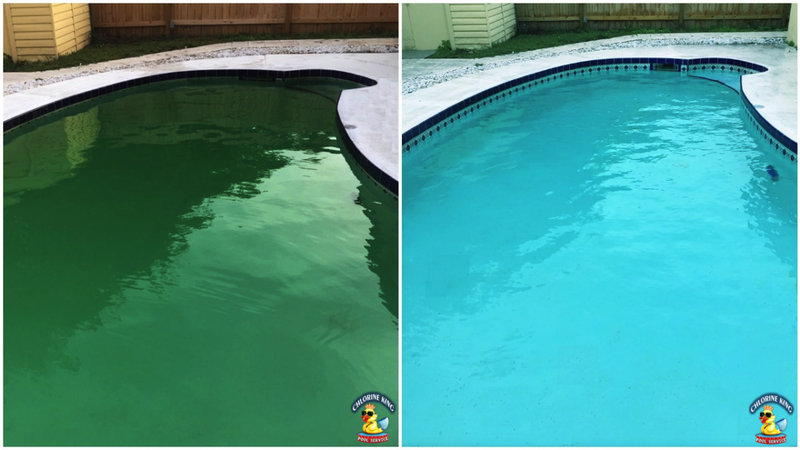 This client just bought a home and received a credit to fix her green pool. In my humble opinion, this was money well spent. Now they can enjoy their pool hassle free and not worry about getting sick. Plus, it's always nice to be able to see the bottom! This pool is located at a rental property that has tenants occupying it. However, with the very significant leak it was very easy to let it get out of control. Upon diagnosing and fixing the leak it was time for Chlorine King to do it's thing and get the pool back up to shape. Although the surface is very aged the pool came around quite nicely! 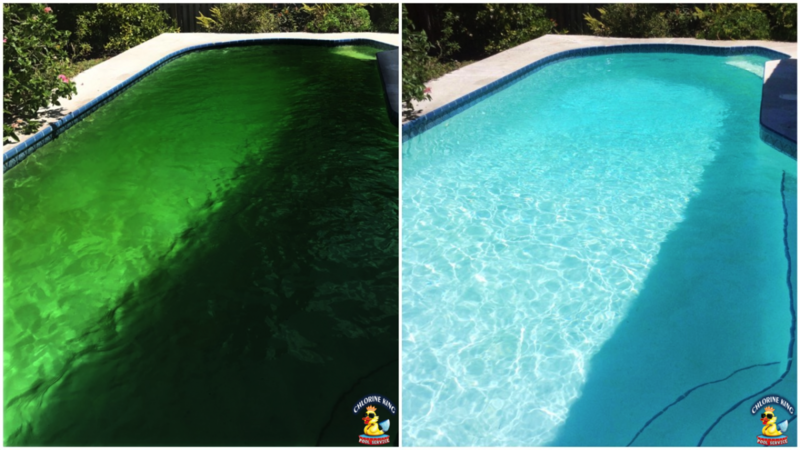 This pool has a chemical imbalance that was contributing to the pool turning green. Once discovered it was quickly treated and back into a healthy swimmable paradise in no time. In order to fix a problem you need to know what's wrong with it. Don't trust this process to just anybody! I've never seen a pool with such a nice emerald color to it when green. With a previous history of working in the jewelry industry the color matched that of the finest Columbian emeralds. Great for jewelry, but not for a swimming pool. Chlorine King got this pool turned around quickly and what a difference now. Sapphire blue? Not quite, but this blue has a nice look to it! Another successful green-to-clean. 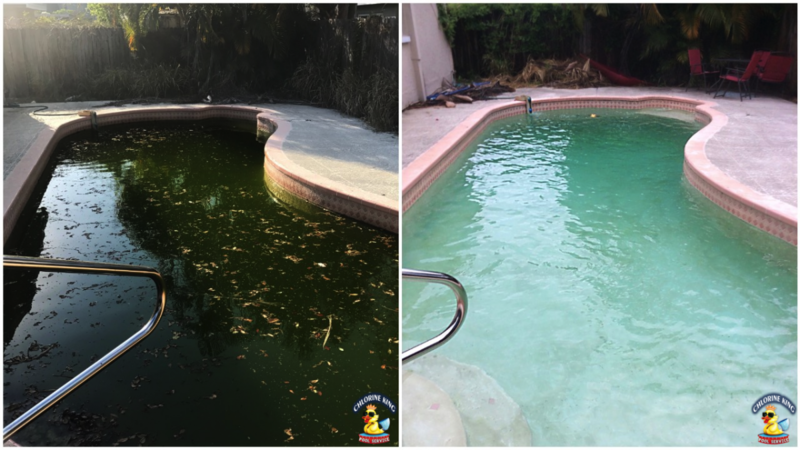 This clients previous company left her hanging and because of that her pool turned green. She gave me a call and in no time we had the pool back up and running! She stated she was impressed with how quickly we were able to turn her pool around. If you want quality results, you need a quality company! 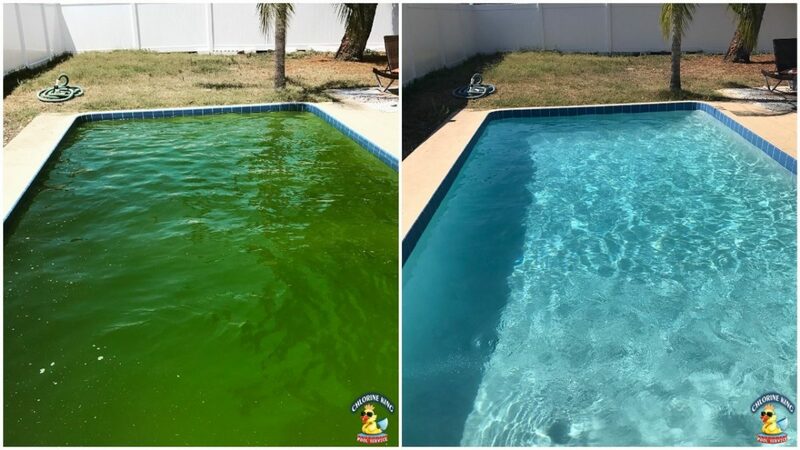 This pool developed it's algae from inconsistent water levels due to a leak. Without wanting to spend money to fix the leak I suggested an auto fill to keep the pool level correct at all times so the filtration could work properly. After installed and a treating the pool looks fantastic! 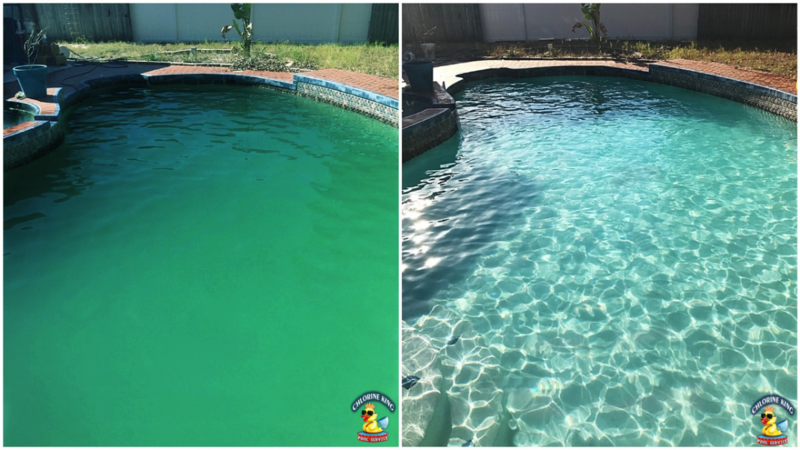 This pool was as green as any other pool we've worked on. 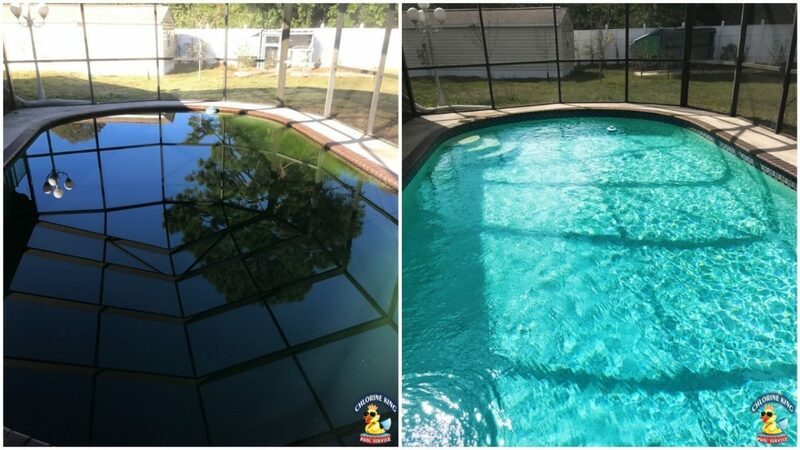 This was a new home purchase and the new owner wanted the pool to be cleaned up so it can be used. 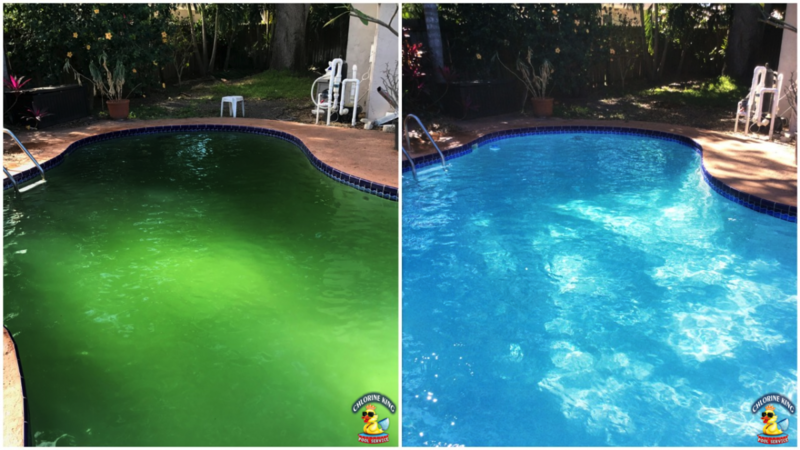 Most companies would say they need to acid wash the pool, at a very large cost plus the expense of filling it back up, but not Chlorine King. 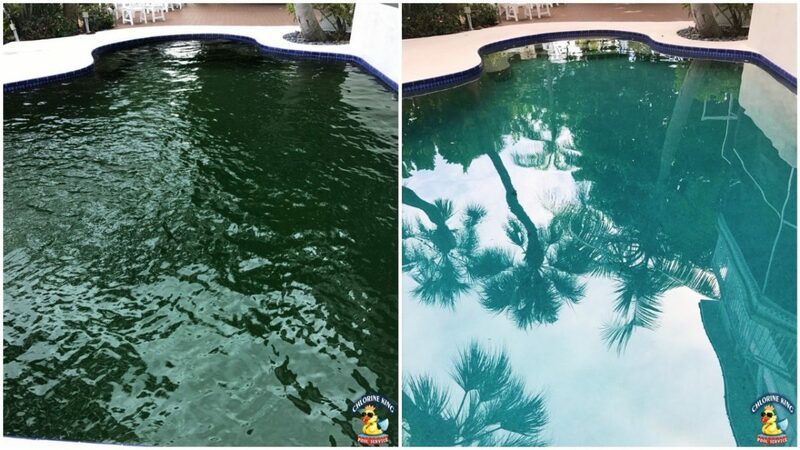 If you are wanting an eco friendly company to clean your green pool then you're at the right place! This was a flip property that was in dire need of some help in regards to the pool. 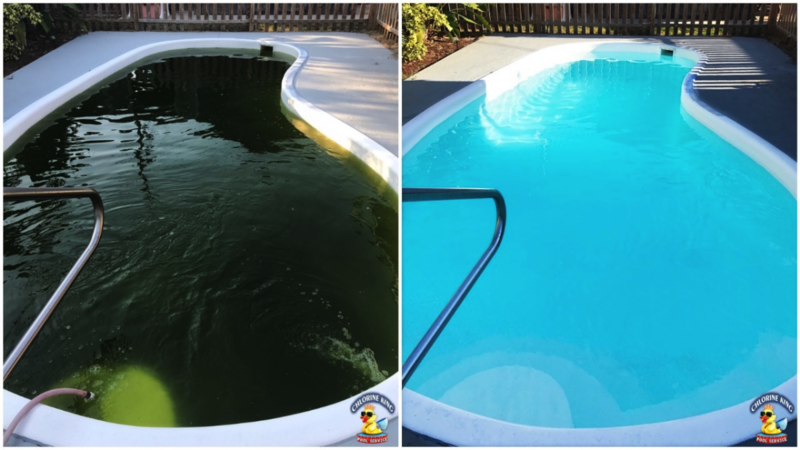 It had some chemistry and filtration issues that left this pool looking like a pond instead of a swimmable hangout for the home. We cater to vacant homes for realtors, flippers or seasonal people that want things taken care of while away. The results speak for themselves! This client reached out to me over my chat feature asking for help with his pool. He said that he travels a lot and isn't home to take care of the pool. It quickly grew out of control. After our green to clean process the results speak for themselves. The owner is thrilled with the results! I was called out to this pool because the owner wanted it cleaned and perfect before the home closed. I promptly came out and got it resolved in no time. The water was not being circulated enough and had chemical imbalances which allowed the algae to prosper. I cured it quickly and now it's ready to enjoy! 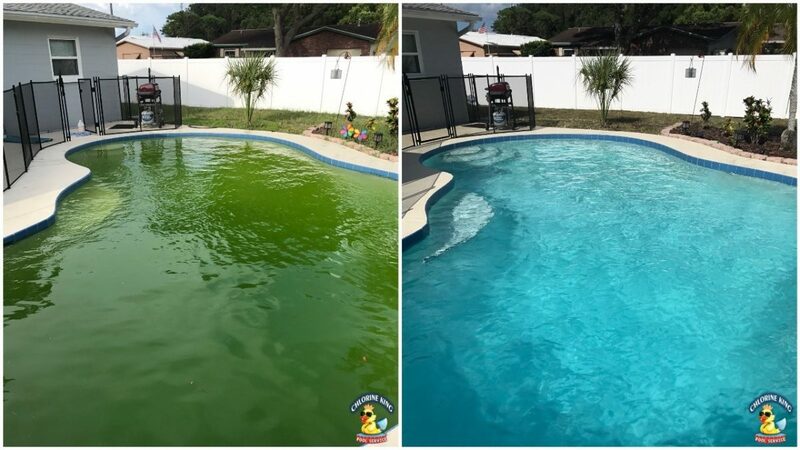 This homeowner just purchased the home and couldn't understand why her pool kept turning green, even after adding gallons and gallons of chlorine. After visiting I let her know that she had a chemical imbalance that was preventing the chlorine from working. We got it situated and now her pool is more beautiful than ever! I was called out to this property because the previous companies were unable to get this pool clean. The equipment set up had a large part in the success of this transformation. A couple of valves weren't turned the way they should to maximize pool filtration and circulation. After a very short time it's perfect and ready to go! 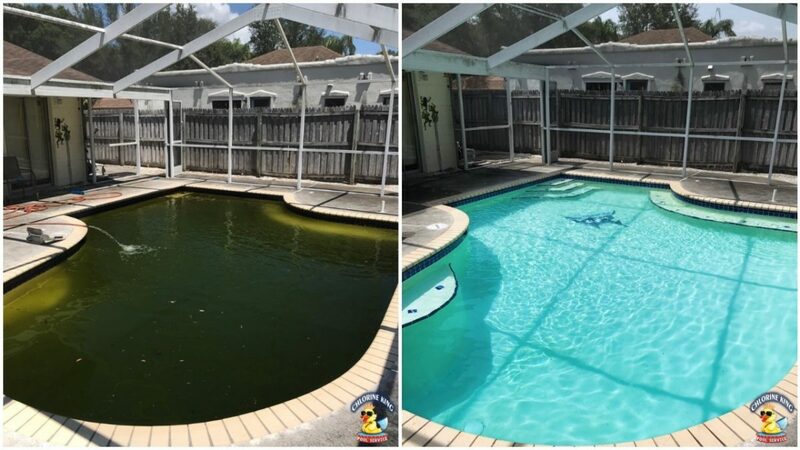 This owner of this pool just closed on his home and wanted to get the pool in control before it gets out of whack. He sent me both of these photos 15 hours apart. What a difference! He said he's excited as ever and looking forward to enjoying his pool. That's the Chlorine King difference! The home owner called me frantic because her previous company had a hard time keeping it clear. 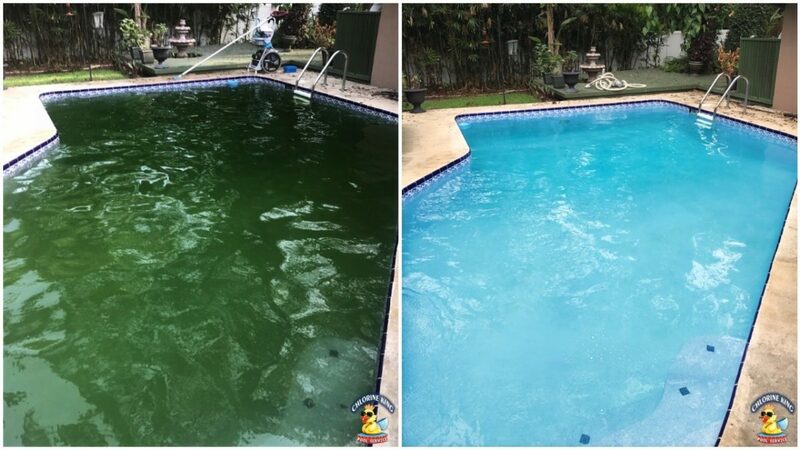 The pool just started to turn green and was able to turn this one around in 12 hours. Stopped the algae dead in its tracks. The home owner told me that her lease is up and for the last year she can count on her fingers how many times the pool has been clear. The owner of this pool wanted to get his property made over so he can put it on the market to sell. The pool was home of hundreds of tadpoles and was nasty on the bottom. 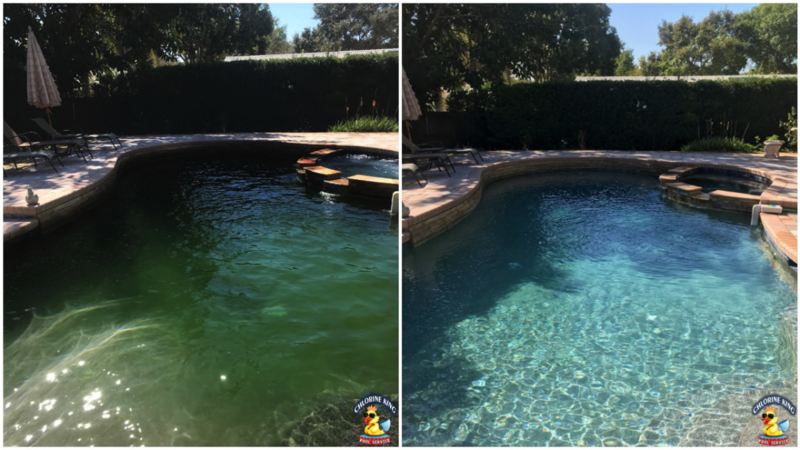 With our proprietary green pool cleanup process we restored this pool to an aquatic oasis. 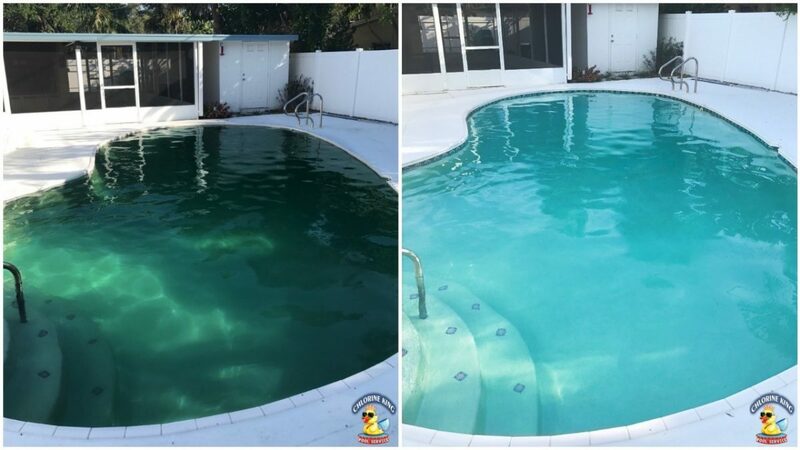 This pool was a rental property that the owner was restoring while the work on the pool was being done. 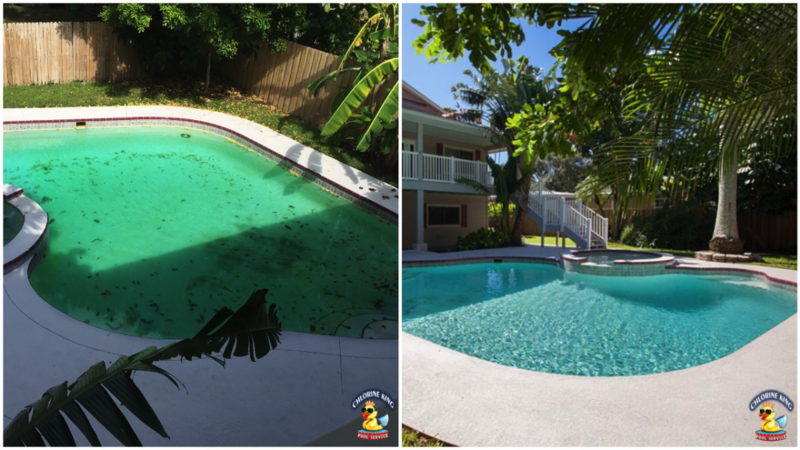 The owner wanted to start showing the home so as the backyard was being rejuvenated he wanted the pool to be done at the same time. The final product came out great! It was raining during the after picture, but it is crystal clear and nicely done! 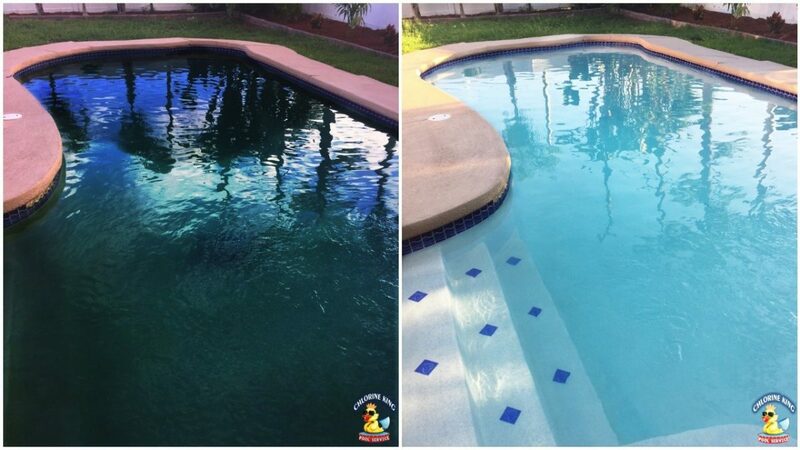 This pool was a rental property and the realtor wanted the pool cleaned up to show for the weekend's open house. We got a call on a Tuesday and we had it done by Thursday evening. How is that for a turn around? Needless to say every one involved was thrilled with the results! The camera played some tricks on the before picture. It was taken after dusk so it auto brightened the picture. This pool had constant issues of going green. The owner was sick of it. He contacted us and we deciphered a chemical imbalance being the cause of the green machine. 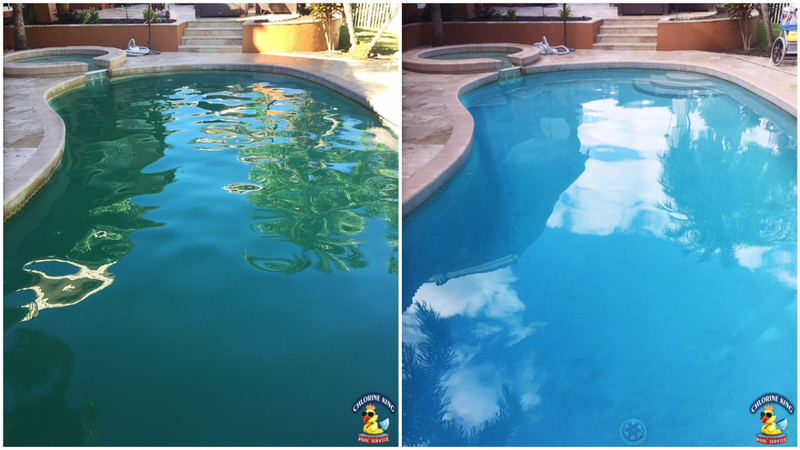 We addressed the specific cause and got his pool crystal clear blue in no time. The owner literally said to us, "My pool hasn't looked this good in months." We love hearing that! This pool sat dormant for 2 years without an ounce of chlorine or any equipment running. 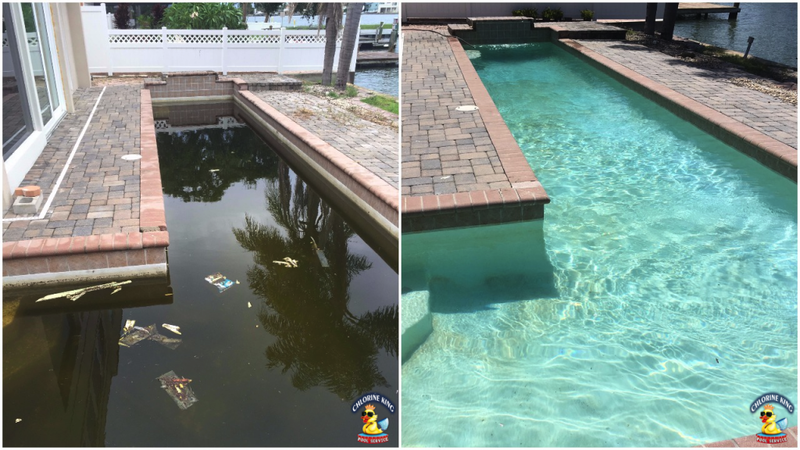 We tackled this project step by step until we restored it to swimmable condition. The owner was very happy with the final result. The neighbors even came over and said they are happy they don't have to look at that anymore. Google Maps even has this pool green from up above. We're looking forward to the update so the neighborhood looks better from the sky!